Here's a surprise -- I'm speeding through Tussie Mussie! I'm quite the slow knitter and I just cast this on a week ago. I'll finish the last nosegay on the front this evening. Of course, then there's four inches or so of straight reverse stockinette. 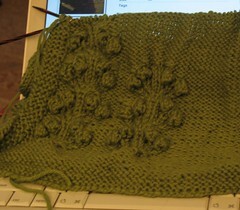 I'll just have to power through that so I can get to the sleeves and more posies! Another surprise -- Iowa (and most of the Midwest) had an earthquake this morning at about 4:40 CDT. I woke up because it made my closet doors rattle. Of course, I didn't realize why they were rattling. I got up and looked in my closet, thinking a cat might have gotten trapped (except that Harley was on the bed and Dolly never comes upstairs). I also briefly wondered if there was some sort of structural catastrophe about to happen. My closet is part of a "bump-out" on the top floor of my townhouse, and my middle-of-the-night brain though perhaps the bump-out was falling off the side of the house. I guess I decided nothing could prevent that if it were about to happen, so I went back to bed! I always forget what a major fault the New Madrid is.... I don't know that we felt it here. We had an earthquake in Vermont seven or eight years ago. I woke up because the house was creaking and groaning. I was sure it had to be a quake and fortunately was able to find some real-time seismographic date online to prove it. Love the Internet! Good luck with Tussie Mussie. I just pulled out two UFOs (one tank, one cardigan) last night and assessed whether I will ever finish them. The tank could be done in a weekend but I have to figure out the waist shaping. Harumph. If I'm remembering rightly, the Mississippi River goes right over a major fault line. (don't quote me on that) It is spring--earthquake weather. I love earthquakes but I hate nighttime ones. I slept right through the earthquake. But I was very aware of the aftershock that happened at around 10:30. At first I thought it was the wind but my house doesn't usually shudder this much ... even in really strong wind. You're sweater is turning out lovely! I am surprised it's not red though. Looking forward to seeing your progress in a few days-yeee!!! !